Deathcore as a genre often gets a bad reputation for being repetitive and creatively bankrupt, and while I can definitely agree with this sentiment when it comes to some of the bigger names in the genre (you can try and guess who I’m having a dig at here), it seems some bands do still try to push the boundaries of what the genre can be. This new Aegaeon album entitled “Age” is a prime example of this. A bold concept album in scope and sound, this 42-minute mammoth definitely offers some of the most unique-sounding deathcore I have heard in years, providing a challenging piece of balls-to-the-wall heavy music that only really started to open up to me properly after multiple play-throughs. Aegaeon, from Denver, CO, hadn’t released a full-length album in 7 years before this one and was one of those bands I had always been meaning to check out, but for whatever reason never did. Well, I am happy I did so with this new release, as it definitely ranks high in this year’s list of metal releases. However, it should be noted that if you’re looking for straight-to-the-point deathcore bangers, this is not where you’ll find it. The reason I state this is because there isn’t really any total standout tracks for me; none of them really sound like single material. I would describe the tracks more so as pieces or movements of a bigger whole. This might sound like a negative point, but rest assured, it’s really not. 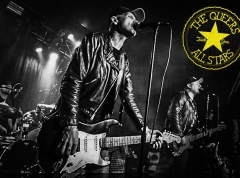 Instead, the album kind of demands to be enjoyed from start to finish with no interruptions, and it is pretty clear to me that this is exactly what the band planned from the start (they have even stated so themselves). Like a score to a movie, the album flows effortlessly between various intensity levels. And it is not completely random that I mentioned movie soundtracks. 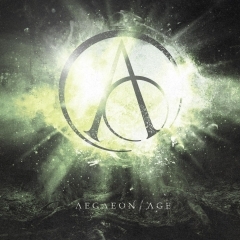 You see, “Age” kind of sounds like what the “Interstellar” or “Blade Runner” soundtracks would have sounded like if Aegaeon had somehow gotten the gig of writing their deathcore take on it, instead of having Hans Zimmer at the helm of that job. While it does contain a lot of chugging, which is basically a staple in the genre, it is made all the more interesting through the huge ambient atmospheres and futuristic synths that are a major focus in their sound. And don’t worry, there are some extremely fast blast beat sections and tremolo picking here and there as well, though they are more scarce than what you would normally hear on a deathcore record. The band isn’t afraid of putting long rests in the music either, to really build the tension and the mental picture of floating through the incomprehensibly massive, empty void that is space, and this was definitely one of the returning major feelings this album evoked. But it also changes in mood about halfway through, from the darker, brooding sound of “Encounter” and “Ruination” (whose start/stop riffing is extremely entertaining), to a more somber, mellow and almost uplifting ending section including “Metamorphosis”, which is also my favourite track alongside the album-closer “Age”, in which the last 2 minutes are absolutely beautiful and chilling, as a single female choir voice wraps it all up perfectly. I think some deathcore fans might be turned off by these aforementioned, long-winding ambient passages, yet I think it’s a welcome, interesting sound that actually amplifies the heaviness when the brutal sections properly kick in. Some aspects of the sound did not sit well with me straight away though. The vocals are brutal, low pitched and very raw, yet could also be classified as being somewhat monotone, as the pitch very rarely changes. Also the drum sound was overpowering to me at first; it is almost ridiculously punchy and the complete opposite of organic sounding. Yet at some point it all just started to click. The vocals make it so there’s is more focus on the music as a whole rather than on some impressive frontman with a massive range, and the over-the-top production makes sense with the theme and overall sound direction the band decided to take. I probably would have preferred the vocals a bit more varied in the end, but I still believe they are enjoyable for what they are, even if I have noticed them being a deal breaker for some people online. To me they are far from a deal breaker, as this is simply just a fantastic and thoroughly creative release in a genre that isn’t always that exciting. I’d love to see where the band could push this particular sound in the future and hopefully it won’t take another 7 years before that happens.